As we zigzagged across the water we knew that we were about to set foot into a different world. If only for a few hours, we were leaving behind our lives of complexity and anxiety – and were about to rediscover the joys of simplicity and absolute tranquillity. Little did we know our host would also be revealing precious gems from our country’s rich heritage. Sitting on the open veranda or Pantaran of Kunyit 7 Lodge sipping cool glasses of lemongrass tea we were in our own little oasis. Enjoying the soothing breeze, we watched as the sun lit up the Mosque with a mystical glow; the boats zoomed past; and people smiled and called out friendly greetings to our host as they walked by – this is a village that is brimming full of life – this is Kampong Ayer, the heart of Brunei. Speaking to the owner of this house, Dk Kemariah Pg. Hj. Duraman about Kunyit 7 Lodge we were immediately captivated by her exuberance and willingness to share her knowledge of the history and culture of the village. Kem is a woman who has travelled extensively to many countries around the globe but has chosen to come back to this simple place called “home”. A place which has been in her family for generations and one which she has skilfully and thoughtfully renovated and decorated in order to turn it into a welcoming and cosy Bed & Breakfast. Perfect for retreats, family reunions or just a quick getaway – Kem’s aim at Kunyit 7 Lodge is to give her guests a truly local experience – one which they will treasure for years to come. Dk Kemariah who is half Malay and half Chinese told us a bit about the history of this house, “This original house was built sometime in the 1920s and belonged to my late grandfather. I decided to call this lodge Kunyit 7 because my grandad loved the spice kunyit (turmeric) and Pg Tujoh (Seven) was his name. My father was born here during the Second World War and he remembers taking people across the water for a few cents or in return for goods. As a child growing up I spent many holidays here with my grandparents and was able to help them as my grandfather was blind and my grandmother was deaf. This house is very special to me not only because it holds many great memories with my family but also because I believe that Brunei has its roots in this water village. At Kampong Ayer we have a unique heritage which we should be proud to share with visitors and pass on to the younger generation.” Kem then gave an example of the important role that the “padians” or women traders played during the past 500 years, selling their supplies from boats on the water. Guests who are curious to find out more about the intricacies of how life was in the water village years ago, will certainly find Kem’s stories absolutely spellbinding! Kem took over the house in October 2014 and slowly began to refurbish and breathe new life into it. 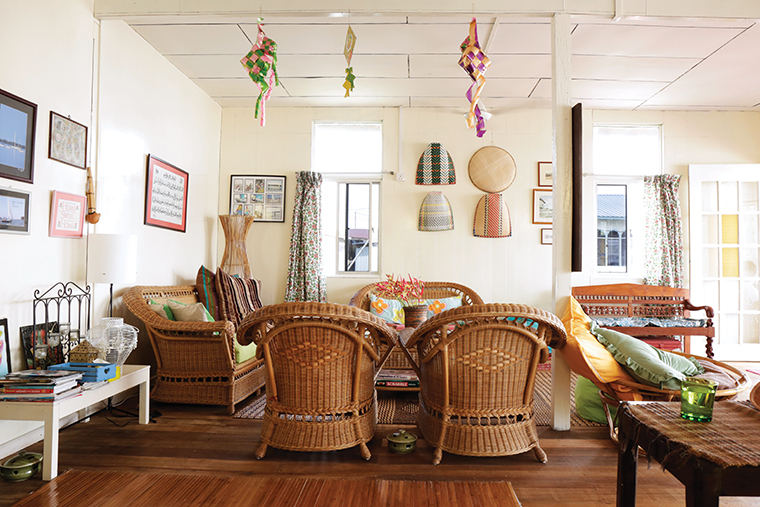 Looking around this light filled airy house, it is clear to see that Kem has worked hard to preserve many of the original features and furnishings at Kunyit 7. 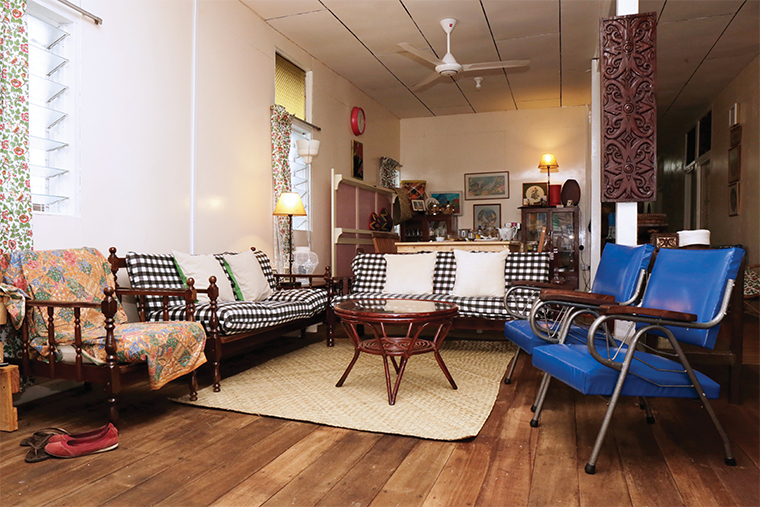 She has sanded and waterproofed the original wooden floors; reupholstered the furniture some of which dates back to around 1961, found a great use for the 55 year old carpet or rug which lies on the veranda or Pantaran; kept the original window frames and doors to the bedrooms; and has many of her antique plates and wares which she inherited from her grandmother. However, when it came to renovating certain parts of the house to make it more comfortable for guests like installing new bathroom facilities – Kem decided to involve as many local contractors as possible in this project as she firmly believes in giving back to the community. But also being quite a practical person, Kem helped with painting and other manual jobs. In addition to this, Kem also has a keen interest in design and sustainability and this is evident in the rustic dining table which she helped to make out of wooden pallets; and her storage shelves made from old door frames. But what makes this lodge feel especially homely and comfortable is Kem’s collection of personal items which are displayed together with traditional objects and ornaments – some of which have been collected from around the region. Kem’s cross stitch and batik artwork together with family photographs adorn the walls; while unique pieces like a Grandfather clock, an old rice pounder, an array of woven baskets, 40 year old clay pots, as well as a 50 year old cabinet which was one of her mother’s wedding presents – all bear testimony to the fact that Kem has specially selected every single item to add charm and interest to the house. Kem has worked in many roles, from being a flight attendant to being a General Manager. She explained that she inherited her strong work ethic from her father who was in the military. As one of the recruits of the 1st battalion of Bruneians trained at Port Dickson, he taught her about discipline, saving and about helping those in need. Today, as a result of her upbringing, she and her family have a great respect for the old ways. They firmly believe in the familial spirit of the community in Kampong Ayer. As we prepare to celebrate Hari Raya this year– Kem’s hospitality and generosity of spirit was a reminder of the core values that were important in Kampong Ayer many years ago– the joy of sharing simple meals with family and friends and of helping others. In keeping with her goal of helping the community Kem’s future plans include teaming up with local people to provide Malay cooking classes for guests. By the end of our visit with Kem we had no doubt that she will definitely succeed in showcasing the best of our hospitality and heritage to the world. This article was published in the July 2015 issue of Inspire Living Magazine. Download it here!